Here I am. The woman who could and would eat nearly anything, reduced to searching for something, anything, that will taste good or at least good to me. How is it that one of life's greatest pleasures has turned into a chore? No longer can I effortlessly sample anything of my choosing. No. Instead I need to carefully envision what will appeal in hopes that it actually will. On one recent occasion, I demand smoked oysters with a dab of mayo and A. brings me a platter. Perfection. 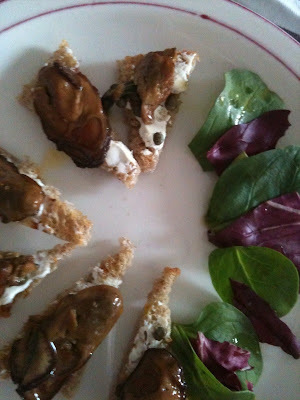 I gobble them all, artfully arranged with a caper and spinach leaves on toast. Today I envisioned corned beef, cabbage and boiled potatoes. I thought it would come thickly sliced, from a nearby restaurant. Instead, my dad brought me 2 platters from a pub near his home. It was not at all what I had in mind, as it was presented, cold on a plate. So I asked that he try an order from the restaurant near my house. It was only marginally better, maybe because it was hot. It too, was not thickly sliced or at all what I had imagined. I ended up with an awful tummy ache. Friends go out of their way to bring me elaborate meals, some quite over the top and inventive. All kinds of extremely healthful meals have come my way. I certainly do appreciate all of the effort that goes into these dishes but I now must confess that simple might be best. I cannot tolerate too many flavors at once. Comfort food tends to be less multi-dimensional and easier for me to tolerate. Ordinarily we are a family of adventurous eaters but in these trying times I think some comfort food might be in order. Of course comfort food varies according to one's background. For me it conjures up visions of my grandmother's food. If she were here I would be asking for Matzoh Ball Soup, Stuffed Cabbage, Blintzes, and Noodle Kugel. But I don't only entertain cravings for Jewish foods. Meatloaf, mashed potatoes, a plain roast chicken, macaroni and cheese would please. Roasted vegetables with one herb and a sprinkling of salt. Salads with a simple vinaigrette. Pasta, pierogi, tuna-noodle casserole, potato gratin and chocolate or vanilla pudding, are foods which also tempt my palate, at least for today. Odd but my cravings match my doctor's latest instructions. Yes. The good news is that I am no longer restricted to a low fat diet, nor am I adhering to all of the Anti-Cancer principles. Instead I have been instructed to eat as much butter, cream, ice cream, sour cream and the like, as I can. And as long as it is organic, grass-fed, local etc., I will do my best to follow the doctor's orders! mmm - pierogi. I'm there! My great grandma taught my mother and her sisters how to make pierogi.......I can't for the life of me eat them boiled, tooooo bland. Have to be sauteed in butter and garlic. I hope your friends start bringing you all kinds of yummy comfort food! I also think you should start having panna cotta for dessert everyday, I know I would! Hope you are feeling okay, haven't seen a post in a while!